Classic game Quake III will be re-released for the web browser on Tuesday, highlighting the rapid development in web games. It runs inside browsers after the installation of a software plug-in. “It is a significant step which proves browser games can be sophisticated,” said Michael French, editor of games industry magazine Develop. Quake Live is a version of a PC game which was first launched in 1999. The game is being released free of charge for browsers by id Software, and is supported by advertising. It opens to the public as a beta later on Tuesday. I especially like the free part but as for the ideea of playing a game like quake in the browser i can’t really say that i am attracted too or see lots of benefits out of it(besides playing it at the office because installing a game at the office allways tends to be a little tricky), but i am not the only person on this earth so who cares if there are other millions who would enjoy it and lots money to be made out of it. One of the bigger complaints about T-Mobile’s G1, the first phone based on Google’s Android platform, is that its touch screen doesn’t use multi-touch, the technology which allows for a screen to accept multiple points of contact as simultaneous input. Now we may know why. Looks like Steve’s karma works even with Google. The main reason for leaving was that I am not satisfied with the way the MySQL server has been developed, as can be seen on my previous blog post. In particular I would have like to see the server development to be moved to a true open development environment that would encourage outside participation and without any need of differentiation on the source code. Sun has been considering opening up the server development, but the pace has been too slow. I would hate to see MySQL turned into ashes. 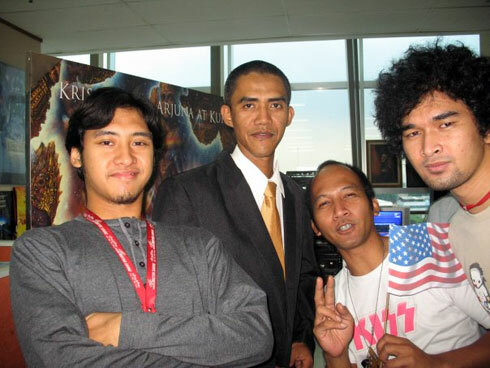 Yes he looks almost like Barack Obama but he is Indian.His name is Ilham Anas.